I am an experienced, qualified and full-time dog behaviourist who specialises in dog behaviour problems, dog expert witness work and representation within the media for dog-related topics. 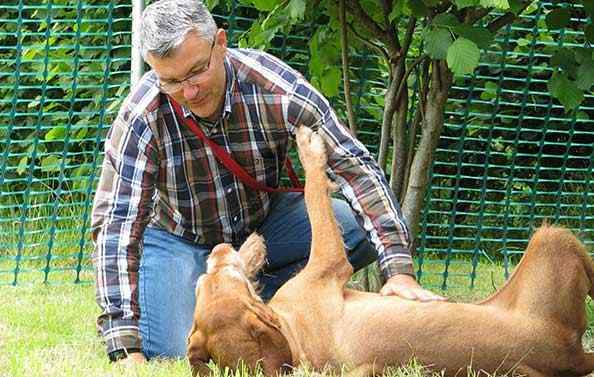 With over two thousand dog behaviour cases behind me, covering all conceivable aspects of dog behaviour, I am still every bit as passionate today about creating an understanding and rewarding bond between dog and owner as I was when I first started my business nearly twenty years ago. I have a Master’s Degree from Middlesex University in dog behaviour (Professional Practice in Canine Behaviour and Psychology). I am a full member of the prestigious Canine and Feline Behaviour Association UK, CFBA, and I undertake numerous training courses to ensure that I am fully up to date with innovative dog related information and practices. As of 2018, I am now “The Pet Behaviourist” for the insurer Petplan UK. I have always enjoyed working closely with people and I have an affinity with dogs. My role as a dog behaviourist in one to one training brings these two elements together perfectly. I have always been passionate about dogs from when I was a young boy, living in Bristol. 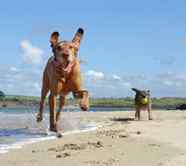 My love for dogs grew when I won my first working test with my 9 month old Hungarian Wire Haired Vizsla, Amber, sparking the idea of running my own dog behaviour practice. This dream was realised when I started Alpha Dog Behaviour when our daughter Katie was still a baby, and my partner Sara was working full time in Birmingham. 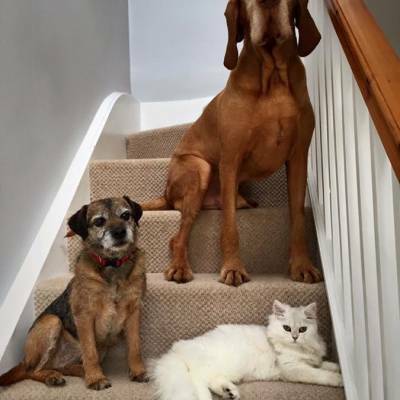 As a family we enjoy living in Bewdley and now have Max, our second Wire Haired Vizsla, aged 9, and Pip our Border Terrier, aged 13, alongside the boss of the house, Doris, the cat. We are currently in the early stages of considering the introduction of a puppy to the household. Sara has now joined me to help run the business smoothly, so I can spend more time with dogs and their owners. 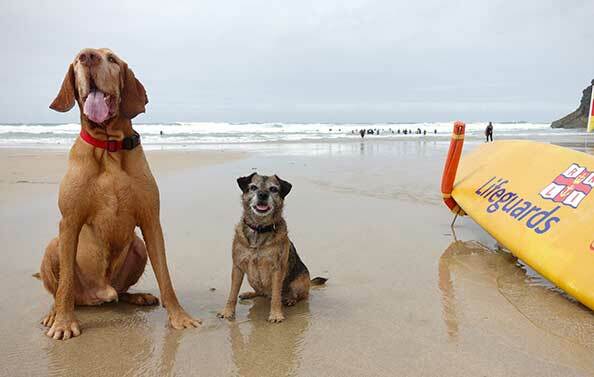 Max and Pip Guarding the Beach! My work as a dog behaviourist usually involves one to one dog behaviour consultations. The process involves the completion of my enquiry form, which can be found here. This initial contact enables me to understand the dog’s history, the nature of the current problems and home set up. This enquiry form can also be used for dog expert witness enquiries. To ensure that you feel confident in me as a dog behaviour specialist, you can view my testimonials here and look at my Google reviews. 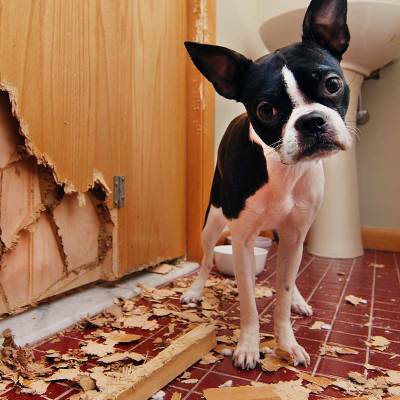 If your dog’s behavioural problem is covered by insurance, I explain the process of setting up the claim and working with your vet for a referral. In most dog behaviour consultation cases, I come to see you in your home twice and each visit can last between 3-4 hours. 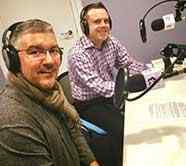 On the first visit I listen to you to fully understand your main concerns that you are experiencing with your dog and to prioritise the dog behaviour issues before us. 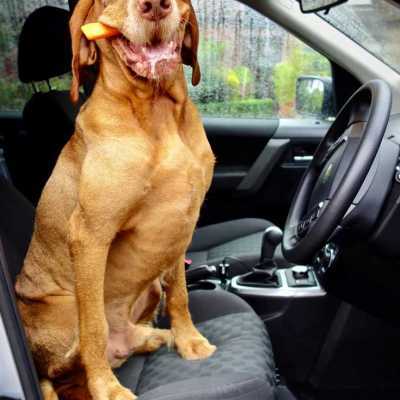 I also assess the dog’s behaviour along with his interaction with you to identify the possible causes of the problems and present a range of solutions to resolve your dog’s behavioural issues. This is followed by agreeing to an easy to follow plan to address your concerns, complete with demonstrations and coaching of the relevant dog behaviour techniques and training. I follow up the home visit with written details of my time spent with you and the agreed plan. This plan is key to help you implement and practice the simple behavioural techniques that need to become routine for you to achieve a positive and lasting outcome. The second visit is an opportunity to follow up on your progress with your dog, refine any areas of ongoing concern and develop enhanced techniques where appropriate. I provide ongoing free email and telephone support which is essential for the best outcome. My methods will allow you to make the improvements you desire, free from shouting or feeling exasperated with your dog and as a result all parties remain calm and collected. This often restores harmony to a home that may be at breaking point due to the dog’s behaviour. Yes, things really can get better, and yes I really can help! It is not just cases of aggression to dogs and people that provide my experience, but dealing with other dog behaviour problems such as predatory chasing, barking, dealing with various fears and phobias in dogs, separation anxiety, recall problems and safety with children and dogs. I am proud to be an independent dog behaviour specialist, running my own business; not bound to follow formulaic methods and practices dictated by a franchise or managing company. For your peace of mind, I have full public liability and professional indemnity insurance and details can be provided on request. I am a full member of the CFBA, the UK’s leading dog behaviour association. This simply means to you that I have had to work hard to fulfil a number of strict criteria to be able to gain their support, thus further ensuring a professional practice and best outcome for you and your dog. I have of course, agreed to the CFBA’s code of ethics for my profession. 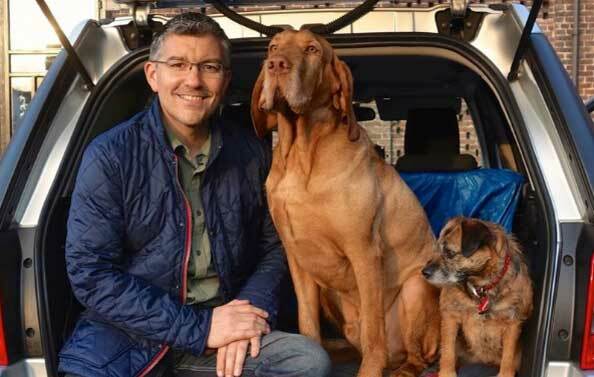 As of 2018 I am now “The Pet Behaviourist” for the UK's largest and most trusted insurer Petplan, carrying out regular Facebook live clinics with dog behaviour questions and answers. I have also had the pleasure of creating a number of dog behaviour and training videos with Petplan, which will be released throughout 2018. 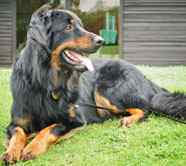 I am able to help you as a dog behaviourist for all your dog behaviour problems. I am also a dog expert witness specialising in dangerous dog behaviour assessments throughout the UK, breed type identification and appearance in court as a dog expert witness. I have a proven track record of saving dogs from destruction and for further reassurance please feel free to read my testimonials from previous clients and solicitors. Working as a dog behaviourist in the West Midlands, I am ideally located to address dog behaviour issues throughout the UK, and abroad on request. 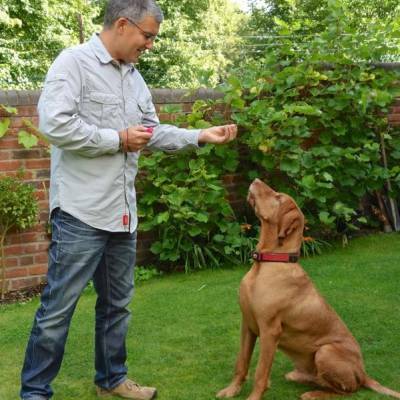 My combination of experience, skills and up to date knowledge makes me ideally suited to help you resolve your dog behaviour problems or to be your dog expert witness to support you and your dog through the legal process for the best possible outcome. Based in Bewdley, Worcestershire, I am well placed to serve the following counties, listed alphabetically: Bedfordshire, Berkshire, Buckinghamshire, Cambridgeshire, Cheshire, Derbyshire, Devon, Dorset, Gloucestershire, Hampshire, Herefordshire, Hertfordshire, Lancashire, Leicestershire, Lincolnshire, London, Northamptonshire, Nottinghamshire, Oxfordshire, Rutland, Shropshire, Somerset, Staffordshire, Surrey, Wales, Warwickshire, West Midlands, Wiltshire, Worcestershire, Yorkshire. Dog behaviour visits and dog expert witness services can be provided in the following areas and surrounds, listed alphabetically: Aylesbury, Banbury, Bath, Bedford, Bewdley, Birmingham, Bridgnorth, Bridgwater, Bristol, Bromsgrove, Cannock, Cardiff, Cheltenham, Chepstow, Cleobury Mortimer, Corby, Cotswolds, Coventry, Daventry, Derby, Droitwich, Dudley, Evesham, Gloucester, Halesowen, Harborne, Hereford, High Wycombe, Kidderminster, Ledbury, Leicester, Leominster, Lichfield, London, Ludlow, Malvern, Milton Keynes, Monmouth, Newbury, Newport, Northampton, Nottingham, Nuneaton, Oxford, Pershore, Reading, Redditch, Rugby, Sheffield, Shrewsbury, Solihull, Stafford, Stoke On Trent, Stourbridge, Stourport, Stratford, Stroud, Sutton Coldfield, Swindon, Tamworth, Telford, Tenbury Wells, Walsall, Warwick, West Bromwich, Wolverhampton and Worcester. On average I travel 70 miles to each client and drive over 25,000 miles per year in my work.